The Computer-Based Aptitude Test Scheduled on 16-04-19 is postponed and the revised date of the Aptitude Test Will be announced shortly. Hi, Candidates Railway Recruitment board has declared the 2nd stage Computer Based Test CBT which was conducted on 21st, 22nd, 23rd January 2019 and 8th February under various RRB’s for the post of Assistant Loco Pilot ALP and Technicians. 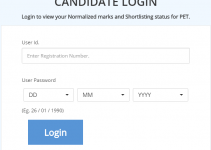 All the shortlisted candidates who have qualified the minimum cutoff marks in RRB ALP Technician result can appear in Computer Based Aptitude test date will be announced shortly. So, Every candidate who was participated in CBT 2nd stage examination held in January and February month are requested to kindly check their scorecard and proceed to appear in the final step of this CEN 01/ 2018 Recruitment process. Candidates can check their RRB ALP Technician result 2nd stage CBT on the official website of the board by following the step by step guide which is updated in this article. Apart from checking the results, they can also read the important guide to participating in the Computer Based Aptitude test which is held on 16th April 2019. The e-call letter will be available for download 4 days before the aptitude test date or from 12-04-2019. Assistant Loco Pilot results are published in PDF format with the roll numbers of qualified candidates and important notice and information for next selection process. All job aspirants needs to read that carefully. The shortlisted candidates for Computer Based Aptitude Test should produce the Vision Certificate in the prescribed format for A1 Standard as per Annexure – VI of detailed CEN 01/2018, in original during Computer Based Aptitude Test, failing which they will not be permitted to appear in the Aptitude Test. 3- If your roll number is written that means you successfully qualified the cut off marks and proceed for the next selection stage which is Computer Based aptitude test. How to download Computer Based aptitude test e-call letter- All the candidates shall be advised through the official website of RRBs / SMS / Email to download their Exam City Intimation advice for the Computer Based Aptitude Test. The e-call letter will be available for download four days prior to the Aptitude Test date. It is expected to be available for candidates from 12th April 2019. Candidates are advised to visit RRB’s official website regularly for new updates. Mock test for Aptitude test- The guidelines and sample Mock link for Computer Based Aptitude Test will be available on the official websites of RRBs and RDSO (www.rdso.indianrailways.gov.in>Directorates>Psycho-Technical) from 10-04-19 to 16-04-19. Candidate may note that the RRB ALP Aptitude Test will be a Computer Based Aptitude Test. The Computer Based Aptitude Test will have a Test Battery comprising of five tests and the candidates will have to secure a minimum T-Score of 42 in each test of the test battery to qualify for the post of Assistant Loco Pilot. This is applicable to all candidates and no relaxation is permissible on any ground. There will be no negative marking in Computer Based Aptitude Test.